This app consists of three files plus the SDK. index.html – loads jQuery and Twitter Bootstrap and has a table to hold the list. It has an input field and add button for adding items to the list. app.js – functions for creating, retrieving, updating, and deleting list items and building the list. style.css – simple styling The complete source code for this app is available on GitHub at https://github.com/dreamfactorysoftware/app-todo-jquery. You can go there to clone this repo to your local machine. In the SDK /lib directory there is a file sdk_init.js. This is where you specify the name of your app and the DSP your app is talking to. For hosted apps that use the DSP for app file storage you could set dsp_url to use location.protocol and location.host and it would always init the SDK to use the “current” DSP. If not a hosted app then dsp_url should be set to the DSP you want to use for that app. When the SDK has been initialized the ‘apiReady’ event is triggered. At that point the app is ready to make API calls. The first thing we should do is check for a valid session and, if none exists, try to log in. The doLoginDialog() and login() methods take care of this. After a session has been established we call runApp() which is the main entry point into the app. The function getRecords() uses the SDK to retrieve all records from the database table named todo. You could easily use NoSQL storage such as MongoDB by adding it as a new service on your DSP, then changing df.apis.db to df.apis.mongodb in each SDK call. 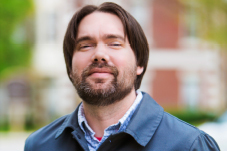 buildItemList() uses this array to populate a table inside the list-container div. Column 1 of the table is for the delete icon. Column two is for the item name. The id of each item is stored in data-id and used when the item is updated or deleted. Note the onclick handlers being set up for the update and delete ui elements. This is where the completion is toggled. When you enter a new item and click the Add Item button, the function createRecord() is called. It grabs the item name from the input field and, if not empty, calls the SDK createRecords() method. The POST data is passed in as the “body” field and is an array of JS objects. In this case there’s only one element in the array. Since it’s a new item we will set the complete field to false. On success the input field is cleared and the list is rebuilt. To keep things as simple as possible we are calling getRecords() to retrieve and rebuild the entire list rather than updating the DOM with only the items that changed. You can click an item in the list to toggle its completion status. Each time you do this the function updateRecord() will be called. 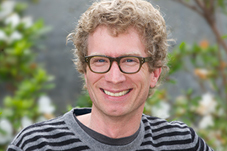 It calls the SDK method mergeRecords() with body containing an array of records to be updated. The database id must be included for each record being updated. You can click the minus button next to an item to delete it from the list. Each time you do this the function deleteRecord() will be called. It calls the SDK method deleteRecords() with the ids field containing a comma-delimited list of ids to delete. Hopefully this gives you a basic understanding of how to use the SDK for CRUD operations. 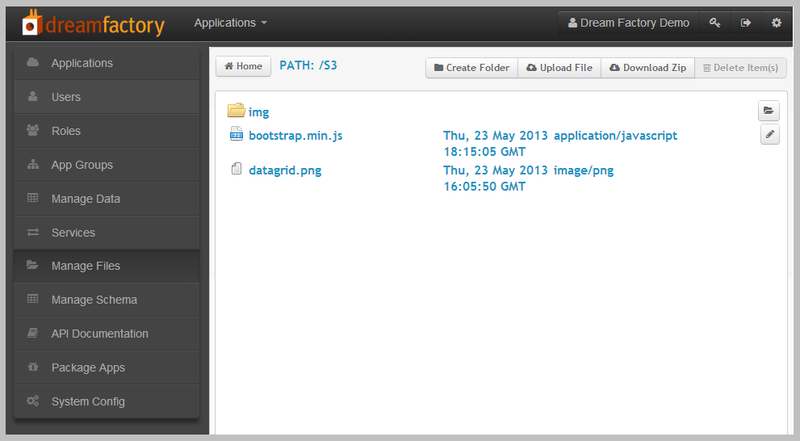 You can experiment directly with the API using the Live API Docs tab in the admin console of your DSP. 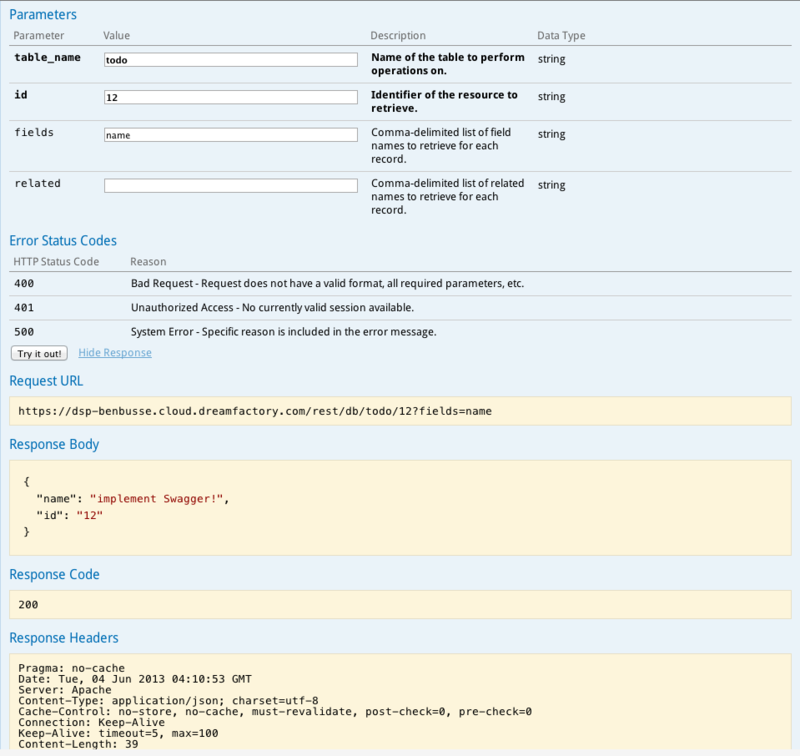 You can use your developer tools to examine each API request in detail. Please post any questions or comments and we’ll get back to you. The ability to build apps from your desktop or local server is a huge plus for developers using their own debug tools, test suites, etc. With our latest Version 1.0.4 release, we now support these use cases plus the ability to run apps from outside of your DSP and still enjoy the flexibility of our REST API. Simply log in to your DSP and click on the System Config menu item on the left hand side. On the System Config screen you’ll see the CORS Access options. Setting * will allow you to work from your desktop or anywhere. You may also use your localhost server, or another DSP or remote server you wish to have access to your data or service. Having the allowed verbs checkboxes enforces another layer of access control by locking down the entire DSP to use only the verbs checked for CORS. A future release will have CORS Access specifiable per application. To use CORS without logging in, you’ll also have to allow for Guest Access, and create a Role for guest user access. This way you can limit any guest access to only database tables or services you see fit. If you’d like to pass authentication instead of having a guest role, consult our Swagger API docs here for the latest API call for logging in a user (see the /user/session POST request). That POST will return a session_id that you can pass as a new header called X-DreamFactory-Session-Token with all your future API requests. You will also need to include the API name you created with your application as X-DreamFactory-Application-Name if you haven’t already. We’ve also added live data through a new publication / subscription framework. We’re using Faye running on Node. Check here for the Faye documentation as well some good advice on security. Need to see it working? Here’s a Plunker showing our Angular Todo Application using CORS and PubSub to talk to our demo server. Enjoy! And as always, if you have any questions, please contact us! Sometimes your application needs to access to external file repositories. We’ve added a super simple way to communicate with Amazon S3 and Windows Azure Blob Storage by setting up a Remote File Service. In this short tutorial, we’ll show you how to quickly set up a Remote File Service. 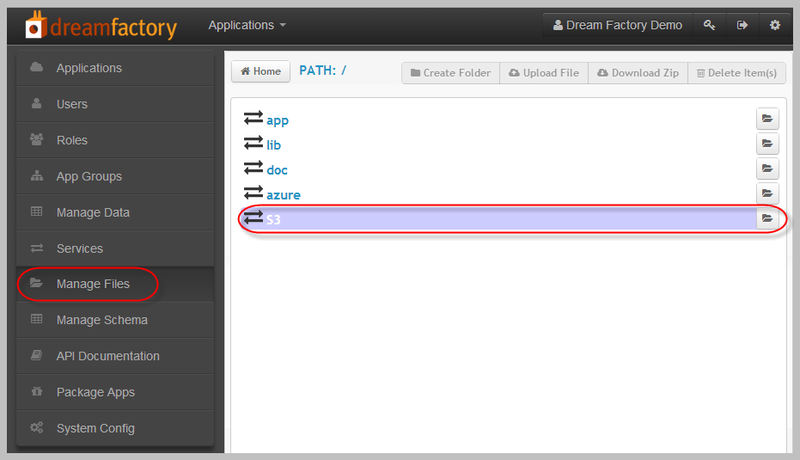 First log into your DreamFactory Services Platform (or “DSP” for short). If you don’t have a DreamFactory account, you can sign up for one here. Set Up a Remote File Service in 60 Seconds Once you’re in the DSP Admin Console, click on the Services menu. Then click on the “Create New Service” Then enter information about the service. Enter a Service Name. The Service Name will be displayed in the Admin Console. You can edit the service later after you’ve created it. Enter an API Name. The API Name will be used when making REST calls within the DSP. Enter a Description of the service (optional). In the Storage Name field enter the folder name where your content is located on either Amazon S3 or Windows Azure. 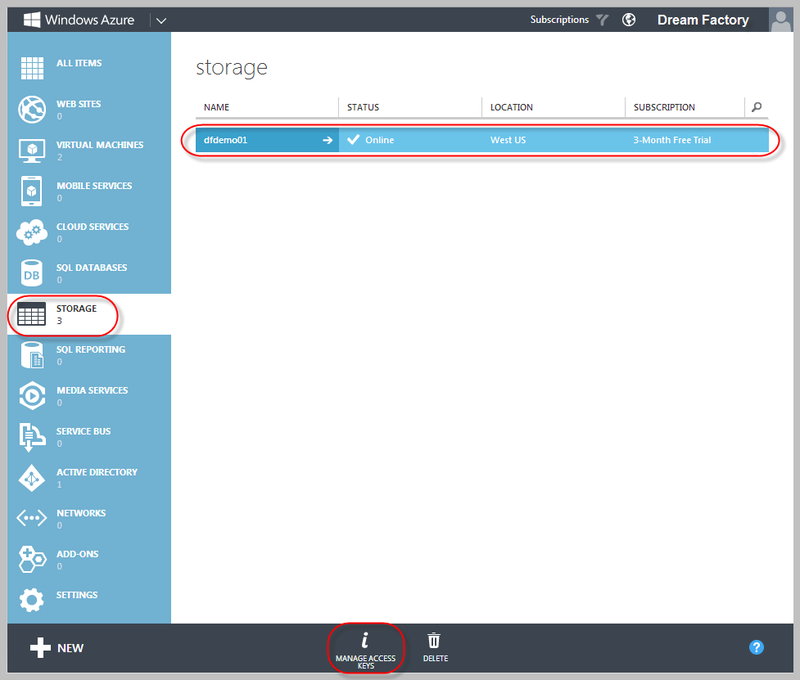 In the Storage Type dropdown, select either Amazon S3 or Windows Azure. See the directions below for adding your S3 or Azure key credentials. Check the Active box to enable the service. 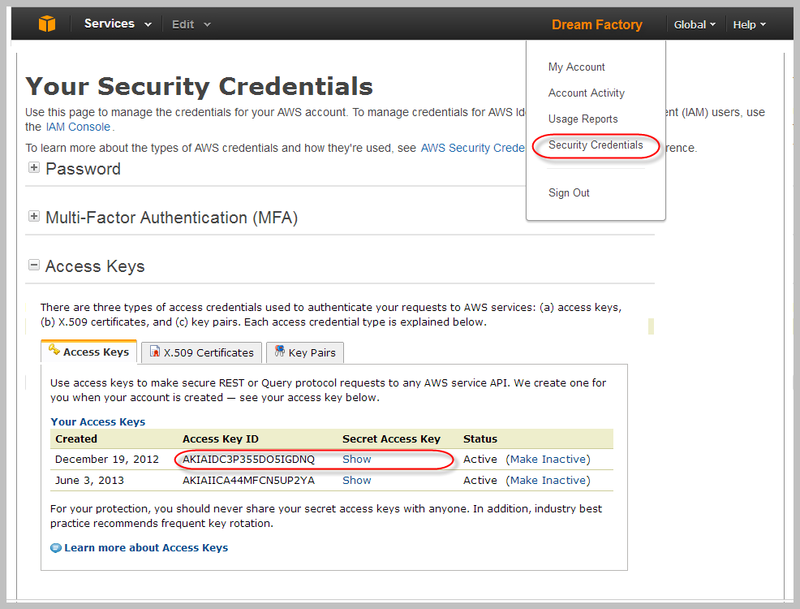 Amazon S3 Users: Add Your Amazon S3 Keys For Amazon S3 you’ll need to provide your Access Key and Secret Key. You can find these values by logging into your AWS account and selecting Security Credentials from the My Account / Console dropdown menu. 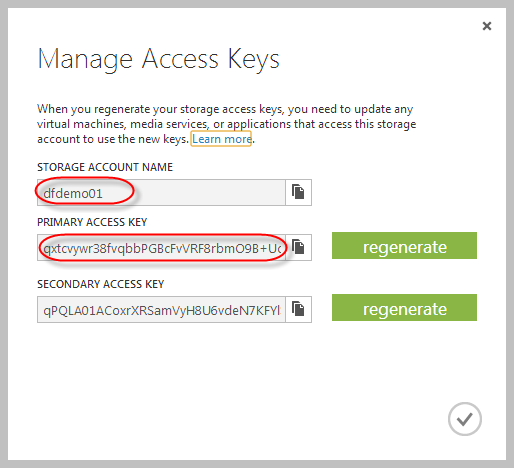 Windows Azure Users: Add Your Windows Azure Access Keys Windows Azure Storage requires an Account Name and Account Key. You can find these values in the Windows Azure Portal. Once you’ve logged into your portal, select the Storage menu item, then select Manage Access Keys on the bottom of the screen. Then copy the Storage Account Name and Primary Access Key into the Account Name and Account Key fields in your DSP. Now Test Your Connection! Now it’s time to test your connection to remote file storage. Select the Manage Files menu item in the Admin Console. You will now see a new entry for the DSP service name you just created. Double click on the service name to view your remote files. And you’re done! Now your application can access all the remote files located in the specified Amazon S3 or Windows Azure folder. Learn More For more information on DreamFactory Services Platform or to set up your own Free DSP visit http://www.dreamfactory.com. Nothing makes a REST API easier to use than good documentation. Well, nothing except maybe a live test environment right there in the documentation. And help with generating client side code to use your API would be awesome too. Come to think of it, having the documentation and test environment dynamic enough to update as you on-board more services would be a major plus. Well, you get all that and more with the latest DreamFactory DSP REST API with Swagger. Why Swagger? We wanted our REST API, and that of any added web services, to be easy to understand, quick to test, and simple to use right out of the box. The Swagger framework solves our server, client, documentation and testing sandbox needs, all in a language-agnostic specification, with plenty of open-sourced server and client side resources already available to help with generation. It also comes with an open-sourced front end, the Swagger UI framework, which quickly allows developers to work with the API, giving them a clear picture of how the API responds to requests with various parameters and options. It helps us to provide what a developer needs to get an app up and running with powerful web services with little time and effort. How does DreamFactory use Swagger? Documenting static services of our API is as easy as annotating server-side code, just as you would use javadoc or phpdoc. You define the API services, including path variables, query parameters, and even members of the posted body data, along with models of any data types passed between client and server. Documentation is then easily generated in various formats (json, xml, etc) and cached for speedy access from clients. We then generate client-side code from the resulting documentation for our API. We use this generated code in our apps, as well as, presenting them as SDK jump-starters for app developers using our platform. 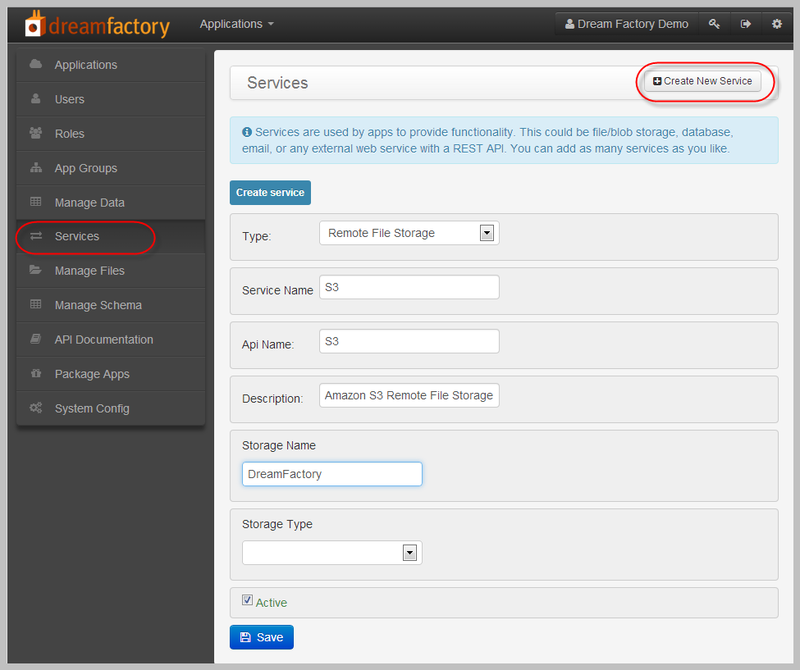 At DreamFactory, we added a little twist by allowing web services to be added or removed dynamically. For any non-native service that is added to your platform’s API, a json or xml Swagger document meeting the specification can be added and/or modified to define that service, immediately making it testable from the included Swagger UI framework and usable by client-side generated code. 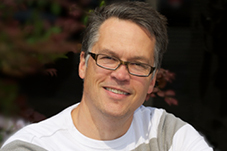 Want to see our REST API in action using Swagger? Try it here. Or create your own free DreamFactory Services Platform and develop until your hearts content. Much has been written about how cloud computing, open source software, and programming frameworks have reduced software development costs exponentially in the last decade. As more than a few pundits have said, “anyone with a good idea and an Amazon Web Services account can now create the next Facebook!” Sure, the hyperbole is for dramatic effect, but the underlying point is true: anyone with programming skills can now create a web or mobile application faster and more cheaply than ever before. The benefits of these advances are clear in the world of startup companies and developers of consumer applications. But how do enterprises, with a far more complex set of requirements and stakeholders, benefit? How do enterprises leverage “agile” and “lean” software development practices, tools, and infrastructure to be more competitive and meet the increasingly demanding expectations of customers, business partners, and their own employees? And how does the technology shift to cloud infrastructure relate to the explosion of “bring your own device” mobile usage at work? 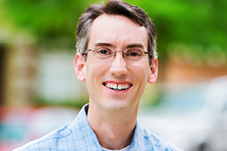 There’s no single silver bullet answer to these questions, but several important trends are relevant to how developers of business apps should be thinking about the intersection of cloud technologies and mobile to make their projects successful. HTML5 is ready for prime time as the best front-end standard for companies that need to build and deploy applications that work on desktop computers, tablets, and phones. HTML5 enables companies to write one application, instead of having to write entirely separate applications for the desktop, iOS, Android, Windows, and other mobile OS platforms. Front-end mobile development toolkits like PhoneGap and Sencha and frameworks like jQuery Mobile and Angular.js will gain market influence since they complement platform- independent development across mobile and web. These toolkits enable developers to package a single application for installation on all mobile operating systems. Users can easily download and install these packaged apps onto their mobile devices just as they would a normal “native” mobile application from an app store. Likewise, the mobile back-end stack for mobile applications will largely be open source, standards-based, pre-configured, highly secure, and architected specifically for mobile usage. And the mobile back-end will not be subject to someone else’s control. You can install it on your own cloud infrastructure or data center. This is the area that we at DreamFactory are tackling. We’ve written more about this in a blog post about the evolution and design goals of the Dreamfactory Services Platform. Developers will benefit enormously from both front-end and back-end simplification and standardization. Now an individual or small team of application developers can quickly create a prototype app, iterate on the design, create the application, and deliver it to end users in a production environment. Standardization also enables reusable design patterns (and reusable source code in many cases). We’ve written more about this in a blog post about the rise of the front-end developer. The promise of these game changing trends is exciting but enterprises are by necessity risk averse and therefore reluctant to introduce new technologies that haven’t been battle tested in production environments. Enterprises need the flexibility and control to use the core back-end infrastructure that suits their application requirements, whether public cloud, hybrid public-private cloud, or on premise. Back-end service platforms like DreamFactory must be easily installed on the desired server infrastructure and must also integrate seamlessly with existing IT development, deployment, scaling, and security tools and practices. We’ll be writing a lot more about this topic in future posts. Stay tuned! After this primer, you’ll have enough knowledge to start building your own application. Also be sure to check out more screencasts, explore the REST API, and get familiar with our documentation. We love feedback! Let us know what you think in the comments. 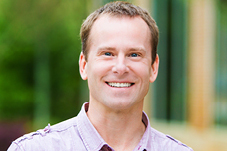 We’ll be posting many screencasts to help you quickly learn how to use DreamFactory to build great apps. 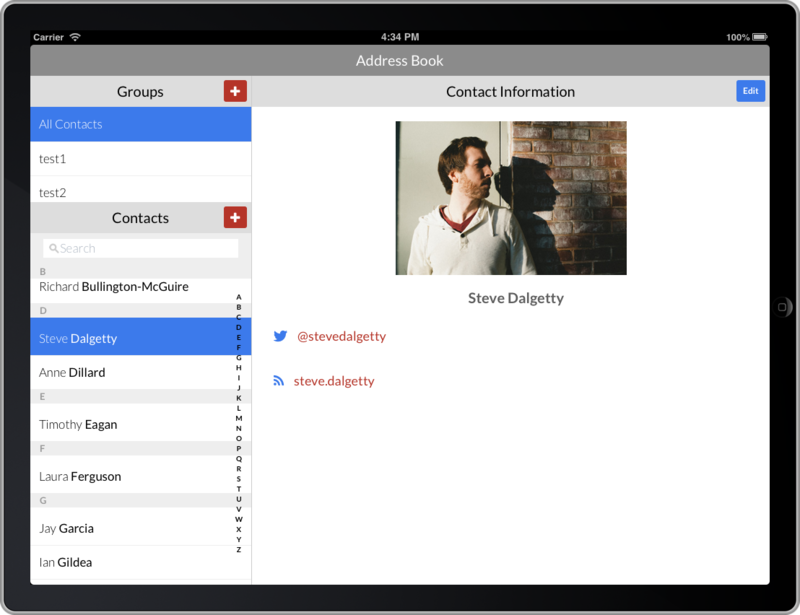 The first one to watch is how to sign up and get started building apps with your free trial of the DSP. After watching Tom’s quick screencast, you’ll be ready to explore the platform on your own and begin building your first application. Once you’ve signed up for a free trial, don’t forget to check out more screencasts, explore the REST API, and get familiar with our documentation. We love feedback! Let us know what you think in the comments.